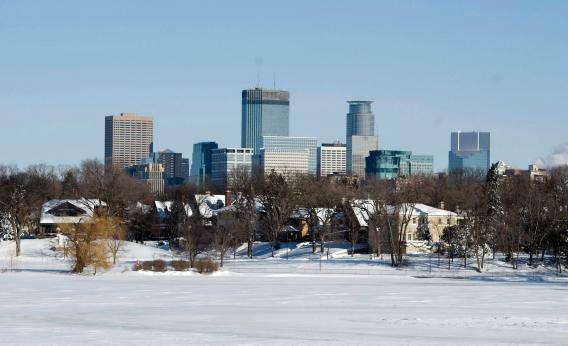 Minneapolis: Research says you should move to the Twin Cities. The downtown skyline as seen from across Lake Calhoun after a snow storm on Dec. 12, 2010 in Minneapolis, Minn. Photograph by Tom Dahlin/Getty Images. A reader asked me the other day for a Rent Is Too Damn High perspective on what city he should live in. On one level, it’s a complicated question. On another level, the answer is that you should move to Minneapolis. Of the 15 highest-income metropolitan areas in the United States, 14 are in high-cost coastal areas. The other one, clocking in at No. 12 with a median household income about 23 percent above the national average, is the Minneapolis-St Paul MSA with its low low Midwestern prices. People appear to be deterred from moving to Minneapolis on the grounds that it’s very cold, but David Schkade and Daniel Kahneman have found that people’s thinking about weather and happiness is dominated by “focusing illusion” in which “easily observed and distinctive differences between locations are given more weight in such judgments than they will have in reality.” They specifically looked at the weather gap between California and the Midwest and found that while Midwesterners thought the good weather in California would make a huge difference in people’s lives, it doesn’t in reality. In terms of other considerations, this native New Yorker was very impressed by Black Sheep Coal Fired Pizza and I think the Timberwolves are underrated this season.